Did you know about the Victory Raised through Morale Bonuses? If you attack and win a lot of times you will see an image that says "Morale Raised through Victory 10% Boost for the next 10mins" Did you also know that if you use a few holy powders within that time frame, it will eventually go up to 30%? Then you have a better chance of winning against the high ranking players for more Honor Points! So make sure you're planning your decks out and attacks right. 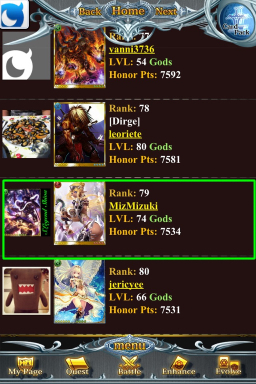 Using 3 holy powders a day can easily boost a player with base attack of 65k into the top 500 each day. Which in my opinion can be more beneficial than waiting till holy wars because there is a higher payout with how often you have to use holy powder vs. how much you gain. I'm sure a lot of you experts already know this, but if you didn't I hope this help get you more points. Just wanted to show you guys how easy it is to make top 100 using this method. I used 5hp yesterday and battled a few times throughout the day. Imagine what rank you could actually achieve by trying!